Thuja occidentalis is grown as an ornamental plant. In alternative medicines, Thuja occidentalis has been used in the treatment of inflammatory and rheumatic conditions. The mother tincture (MT) and Homoeopathic dilutions of Thuja occidentalis are used in the treatment of upper respiratory tract infections and inflammatory conditions associated with infections including bronchitis, pharyngitis, otitis media and sinusitis., The in vitro and in vivo experimental studies on the extracts of Thuja occidentalis have reported its immunostimulatory effects including increased proliferation of splenocytes in mice, induction of interleukin (IL) IL-1, IL-6 and tumour necrosis factor alpha (TNF-α) from the mouse macrophage induction of CD4+ T-cell and production of IL-2 and interferon-γ. However, in the tumour-bearing mice, aqueous extract of Thuja occidentalis and its polysaccharide fraction have been reported to stimulate cell-mediated immunity. Treatment of tumour-bearing mice with Thuja occidentalis resulted in increased natural killer cell activity, antibody-dependent cellular cytotoxicity and antibody-dependent complement-mediated cytotoxicity. The treatment with Thuja occidentalis extracts decreased the elevated level of IL-1β, IL-6, granulocyte-macrophage colony-stimulating factor and TNF-α in the serum of metastatic tumour-bearing mice. This study concluded that Thuja occidentalis inhibited the production of pro-inflammatory cytokines and stimulated cell-mediated immune response. Aqueous extract of Thuja occidentalis and polysaccharide fraction have been reported to reduce the paw oedema induced by carrageenan, dextran sulphate, serotonin, bradykinin, histamine and prostaglandin E2. This study has reported that the Thuja occidentalis extract reduced the myeloperoxidase activity, decreased pro-inflammatory cytokine levels and reduced oxidative stress in mice challenged with different phlogistic agents. All these evidences suggest that Thuja occidentalis extract may have a role in the treatment of inflammatory and autoimmune conditions. In Homoeopathy, Thuja occidentalis is prescribed in the treatment of rheumatoid arthritis. However, controlled clinical trials on the Homoeopathic dilutions of Thuja occidentalis as an anti-arthritic medicine have either proved non-conclusive or have reported no benefit over the placebo., A prior study conducted by our group revealed that the Homoeopathic dilutions of Thuja occidentalis inhibit the lipopolysaccharide-induced pro-inflammatory cytokine release and oxidative stress in the mouse macrophage cell line (RAW-264.7) in vitro. Similar effects were observed in the in vivo model of lipopolysaccharide (LPS)-challenged mice. The MT, 3cH, 6cH, 30cH and 200cH Homoeopathic dilutions of Thuja occidentalis inhibited the in vitro and in vivo effects of bacterial polysaccharides on the mouse macrophages. The immunomodulatory and anti-inflammatory activities of the Thuja occidentalis aqueous extract and its polysaccharide-rich extract have been verified through in vitro and in vivo experimental models. In the present study, we evaluated the anti-arthritic effects of Homoeopathic dilutions of Thuja occidentalis against the complete Freund's adjuvant (CFA)-induced arthritis in rats. Male Wistar rats (150–200 g) were used for the study. The animals were obtained from the Central Animal House Facility, Department of Pharmacology, R. C. Patel Institute of Pharmaceutical Education and Research, Shirpur. Animals were housed in well-ventilated polypropylene cages and maintained under standard conditions (25°C ± 2°C, 12:12 h light and dark cycle) in the departmental animal house. The animals were fed with standard pelletized feed (Amrut Rat feed, Pune) and water was provided ad libitum. The study was approved by the Institutional Animal Ethical Committee registered with the Committee for the Purpose of Control and Supervision of Experiments on Animals, India (Approval No: IAEC/RCPIPER/2017–18/15). Homoeopathic dilutions of Thuja occidentalis were manufactured by Sintex Industries Pvt. Ltd., Ahmedabad, India, with the following batch specifications: MT (MT51/THO), Thuja occidentalis 6cH (230THO6), Thuja occidentalis 30cH (230THO30) and Thuja occidentalis 200cH (230THO). The Thuja occidentalis leaf extract (crude form) was supplied by Indian Pharmacopoeia Laboratory, Ghaziabad (Authentication Letter No. HPL/P. 19029/Part-1/2013-2014/399). CFA (Difco, USA. Lot No. 0090500) was purchased through an Indian distributor. Diclofenac sodium (Brand: Dynapar Injection, Batch No. D23S118) was purchased from a local Vendor. ELISA Kits for TNF-α (Cas No. 88–7324), IL-1β (Cas No. 88–7013) and IL-6 (Cas No. 88–7064) were obtained from eBioscience, USA. Male Wistar rats were divided into eight groups, with each containing four animals. Group I was control and received a single daily dose of 1 ml normal distilled water by oral gavage, Group II CFA-injected group, Group III was standard and received a standard drug diclofenac at 5 mg/kg, p. o., Group IV to Group VII received MT, 6cH, 30cH and 200cH. Group VIII received Thuja occidentalis leaf powder twice daily at 30 mg/kg of body weight as a suspension in the 0.5% carboxymethyl cellulose (CMC) in water. Arthritis was induced by subplantar injection of 0.1 ml of adjuvant into the right hind paw of each rat on day 0. The Homoeopathic dilutions of Thuja occidentalis were prepared as 0.1 ml of each dilution was added to 1.0 ml of sterile distilled water and administered through oral gavage to respective groups twice daily.Thuja occidentalis crude powder was suspended in 0.5% CMC and administered through oral gavage at a dose of 30 mg/kg. Care was taken to abstain animals from food immediately before and after drug administration for at least 2 h.Thuja occidentalis crude form and dilutions were administered twice daily once for 21 days starting from the day of CFA injection. The primary and secondary lesions and paw volume of injected and non-injected paws were measured using a digital Plethysmometer (UGO Basile 7140, Italy). The lesions were measured on 0, 7th, 14th, 21st and 25th days after injection of the adjuvant. The Von Frey plantar test is a measure for acute mechanical pain sensitivity. An Electronic Von Frey anesthesiometer, (IITC Life Sciences, Australia) was used to measure the paw withdrawal threshold (PWT). The PWT was reported as the pressure in grams required to elicit paw withdrawal. The PWT was determined on days 0, 7, 14 and 21. Changes in body weight have also been used to assess the course of the disease and the response to therapy of anti-inflammatory drugs; as the incidence and severity of arthritis increased, the changes in the body weight of the rat also occurred during the course of experimental period of every 3rd day. Grading of cellular infiltration (polymorphonuclear cells, macrophages or lymphocytes), angiogenesis, synovial hyperplasia, pannus formation, narrowing of joint space, cartilage destruction and bone erosion of the ankle joints were examined in a blind fashion by two independent observers using a semi-quantitative scale from 0 (normal), 1 (mild changes), 2 (moderate changes) and 3 (severe changes). On the 25th day of dosing, the rats were sacrificed by using high dose of ketamine and xylazine. The hind paw tissue biopsy samples were collected. A 10% tissue homogenate was prepared in ice-cold phosphate-buffered saline by using homogeniser followed by sonication for 5 min. The homogenate was stored at −20°C till further analysis. Pro-inflammatory cytokines were determined in the homogenate of hind paw tissue by using sandwich ELISA. Cytokines such as TNF-α, IL-6 and IL-1β were determined according to protocol provided by manufacturer, and the values were calculated from optical density. At the end of the experiment, hind paw of rat was isolated and stored in 10% formalin solution. Thin sections of rat paw were taken and fixed in paraffin and stained using haematoxylin and eosin. Arthritic scores were measured by proving blinded slide to pathologist. Articular changes, with particular attention to the articular cartilage, pannus formation, ankylosis and joint obliteration. Each of these parameters was scored on a scale of 0–3. 0 = absent, 1 = mild, 2 = moderate and 3 = severe. Each parameter was graded mild, moderate or severe, using the following criteria. The data were expressed as mean ± standard error of the mean. The statistical analysis was performed using one-way and two-way analysis of variance followed by Bonferroni's multiple comparison Post hoc test and Holm–Sidak's multiple comparisons test; ***P < 0.001; **P < 0.01, *P < 0.05 as compared with the CFA group;###P < 0.001 as compared with the normal group. *P < 0.05 was considered statistically significant. CFA injection induced a time-dependent and significant rise in the paw volumes. On the 25th day, average volume of the CFA-injected paws was almost double than the normal paw volume. 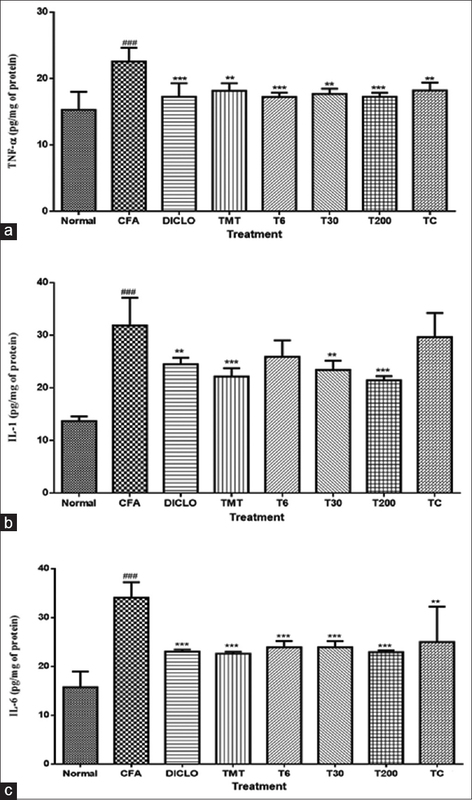 Thuja occidentalis MT, 6cH and 30 cH dilutions significantly reduced the ipsilateral paw volume that indicated a reduction in the inflammatory changes induced by CFA injection (P < 0.001). The crude form, MT and 200cH dilutions were less effective in reducing the inflammatory changes induced by CFA. The effect of Thuja occidentalis 6cH dilution was most potent amongst its tested dilutions. The standard drug diclofenac restricted the paw inflammation and on 25th day of observation, the paw volume of this group was almost similar to that of the normal control group as shown in [Figure 1]. The rise in the volume of contralateral paw indicates immune-mediated component of the effect of CFA. All the tested dilutions of Thuja occidentalis along with its crude form significantly inhibited the rise in the volume of contralateral paw (P < 0.001). MT treatment was least effective in reducing the paw volume. Thuja occidentalis dilutions appeared to be as effective as diclofenac in reducing the volume of the contralateral paw [Figure 2]. The mechanical allodynia was determined in the CFA-injected paws. It was observed that CFA-induced inflammation was associated with significant allodynia evident as a decrease in the pressure required to elicit paw withdrawal (P < 0.001). Thuja occidentalis dilutions 6cH, 30cH and 200cH were effective in increasing the PWT, whereas the MT and crude form were the least effective [Figure 3]. The PWT of rats treated with diclofenac was similar to that of the control group. The pain and immobility associated with the CFA-induced inflammation lead to decrease in the food intake. 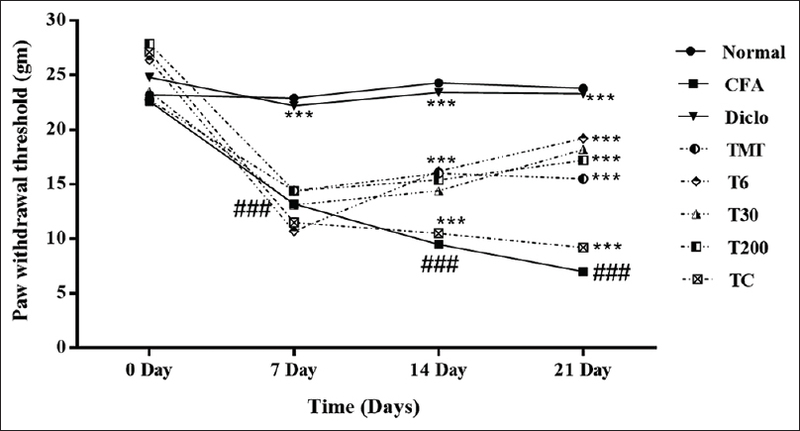 Such reduced weight gain was evident in only CFA-treated rats. In the rats treated with 6cH dilution, the body weight gain was similar to that of the normal group. 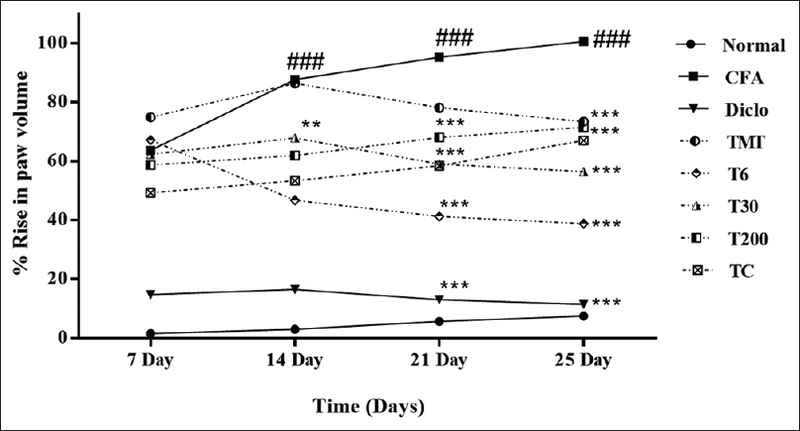 The groups treated with other Thuja occidentalis dilutions had weight gain during the observation period of 25 day; however, the weight gain was lesser as compared to the control group [Figure 4]. The joint radiographs of representative rats from each group were analysed for changes such as swelling, bone resorption, bone erosion and narrowing of the joint spaces. CFA induced soft-tissue swelling, narrowed the joint space and induced bone erosion and resorption. These changes were inhibited by the Thuja occidentalis treatment [Figure 5]. The radiological alterations were arbitrarily scored by a blinded radiologist [Table 1]. CFA injection induced a significant increase in the tissue levels of TNF-α, IL-6 and IL-1β as compared to the normal group (P < 0.001). 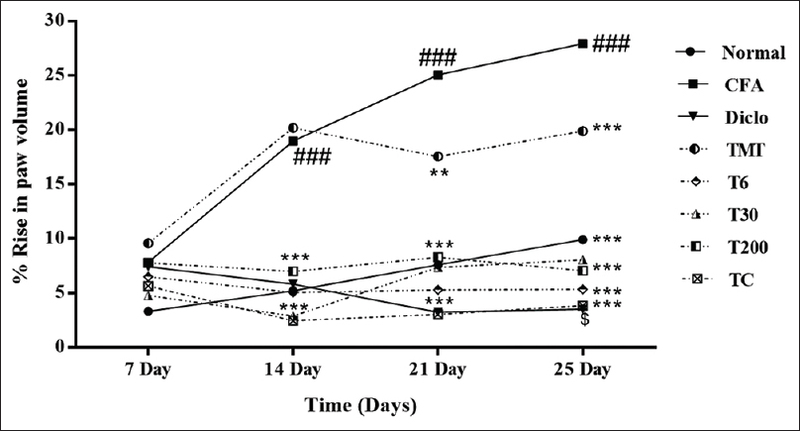 Treatment with Thuja occidentalis reduced such rise in the pro-inflammatory cytokines invariably in all the tested dilutions including MT (P < 0.001) as shown in [Figure 5]. 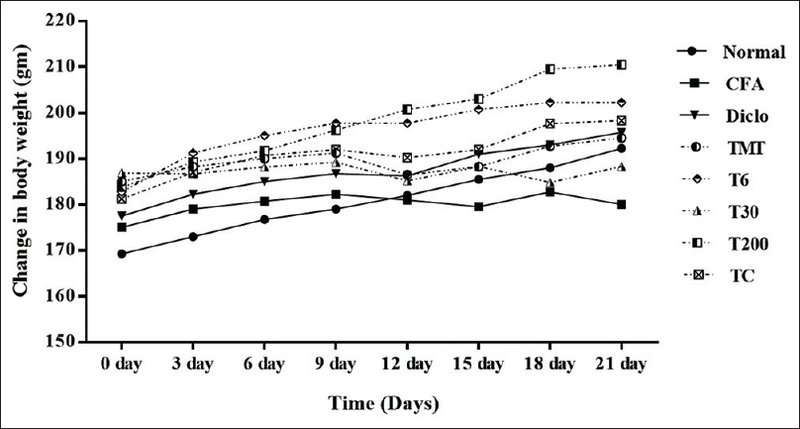 The effects of all the tested dilutions of Thuja occidentalis were consistent and significant (P < 0.001) as compared to CFA-injected rats [Figure 6]. The histological evaluations revealed that there was disruption of bone and joint structures along with severe mononuclear infiltration in the bone joints of the CFA-injected rats. Bone and joint structure in the diclofenac-treated rats had dense bony plates and intact articular cartilages. The joint histology of rats treated Thuja occidentalis prevented bone and cartilage destruction [Figure 7]. Thuja occidentalis treatment reduced oedema and inflammatory infiltrations into the joint spaces. The histological alterations were scored and are mentioned in [Table 2]. The leaf extract of Thuja occidentalis is used as a source material in the formulation of Homoeopathic dilutions of Thuja occidentalis. The chemical constituents of Thuja occidentalis have been exhaustively explored and their pharmacological actions are well reported. The extracts and isolated constituents of Thuja occidentalis possess diverse biological effects including anti-inflammatory and analgesic, immunomodulatory, and antimicrobial. The crude form of Thuja occidentalis administered at 30 mg/kg/b. i. d doses was found to be less effective in reducing the CFA-induced inflammation in rats. Thuja occidentalis has been reported to exert anti-inflammatory effects against the carrageenan-induced paw inflammation in rats at 3, 10 and 30 mg/kg intraperitoneal doses. Another study has reported that Thuja occidentalis extract inhibits carrageenan-induced paw oedema in rats at 200 mg/kg and 400 mg/kg oral doses. These doses also reduced the acetic acid-induced writhing and increased the formaldehyde-induced paw withdrawal latency. Janadri and Gowda indicate that oral administration of the Thuja occidentalis extract needs higher doses for induction of anti-inflammatory and analgesic activities as compared to the intraperitoneal doses. In our study, we administered the Thuja occidentalis crude form at 30 mg/kg dose and hence, lack of anti-inflammatory activity and anti-hyperalgesic activity may be attributed to this small dose administered orally. The Homoeopathic dilutions of Thuja occidentalis also exerted significant anti-hyperalgesic activity in arthritic rats. In the present study, we observed the striking ability of Homoeopathic dilutions of Thuja occidentalis to reduce the CFA-induced inflammation and analgesia, which indicates that the Homoeopathic dilutions provide advantage over the administration of the crude form by oral route. In case of pro-inflammatory cytokine concentrations in the CFA-treated rat paw tissue, there was significant decrease in the levels of the pro-inflammatory cytokines. The crude Thuja occidentalis-treated groups, however, were less effective in reducing the IL-1β and IL-6 levels as compared to the Homoeopathic dilutions. The extracts of Thuja occidentalis leaves and the polysaccharide fraction are known immunomodulators. These effects of Thuja occidentalis Homoeopathic dilutions were reproducibly proved using the model of LPS (1 μg/ml)-induced cytokine release from RAW-264.7 cells and human whole-blood culture in vitro and also using model of LPS (0.5 mg/kg, i. p.) induced cytokine release and oxidative stress in vivo in mice. Similar decrease in the pro-inflammatory cytokine levels was observed in the CFA-injected paws tissue of the rats treated with Homoeopathic dilutions of Thuja occidentalis. In congruence with these effects on the paw inflammation, hyperalgesia and cytokine release, Thuja occidentalis treatments significantly protected the paw joints and surrounding tissues from the CFA-induced alterations. 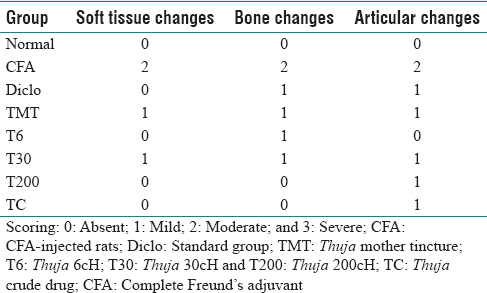 The X-ray and histology images indicate that the crude form and MT of Thuja occidentalis were comparatively less efficient in inhibiting the histological perturbations and bone damage induced by CFA. As a standard drug, we used orally administered diclofenac at 5 mg/kg dose. Chronic administration of diclofenac exerts deteriorating effects on the bone density, and this has been reported earlier in the CFA-induced arthritis model in rats. Similar effects of diclofenac were evident in the X-ray images captured for the present study. It was observed that the periarticular bone resorption, periarticular bone erosion and the narrowing of the joint spaces were prominent in the rats receiving diclofenac. Whereas, Thuja occidentalis Homoeopathic dilutions reversed the CFA-induced arthritic changes. The inflammation induced by CFA in the contralateral paw indicates the immune-mediated alterations. These secondary lesions provide the extent of immune-mediated inflammatory alterations which are affected by the immunosuppressive agents. The secondary lesions enable the distinction between the anti-inflammatory and the immune suppressive effects of the test drugs. In the present study, we could not find significant difference in the pattern of reduction of paw volume in the CFA-injected and the contralateral paws. Hence, with the present set of data developed by us, it is not possible to differentiate whether the observed effects of Thuja occidentalis dilutions against CFA-induced arthritis involve its anti-inflammatory or immunomodulatory activity. The reduction in the pro-inflammatory cytokines in Thuja occidentalis-treated rats, however, indicates that the decreased cytokine levels may involve in the suppression of humoral immune response. 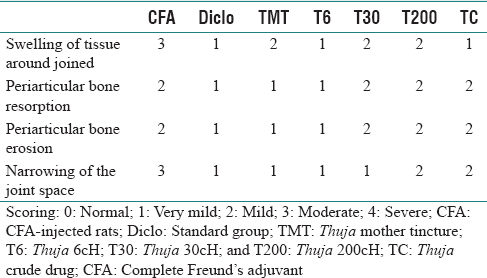 Though the present study does not provide any mechanistic insight into the anti-arthritic effects of the Homoeopathic dilutions of Thuja occidentalis, it provides a proof for their efficacy in reducing the characteristic alterations induced by CFA. The major concern in acceptance of homoeopathic medicines is the lack of reproduciblility in experimental and clinical proving of therapeutic efficacies. However, a recent upsurge in the evaluations of the Homoeopathic drugs and their dilutions using validated bioassay has instigated renewed interest in the pharmacology of Homoeopathic drugs. The present findings provide evidence to support the anti-arthritic efficacy of Homoeopathic dilutions of Thuja occidentalis using validated experimental models of CFA-induced arthritis in rats. We would like to thank Dr Pankaj S. Deore for his kind help in radiological analysis and to the Director, Homeopathic Pharmacopoeia Laboratory, Ghaziabad, India, for generous supply of authenticated sample of crude form of Thuja. Thanks are due to Dr Shivang Swaminarayan, Sintex Healthcare, Ahmedabad, India, for supplying the test drugs and kind support for the research work. We acknowledge the financial support received under the Extramural Research (EMR) scheme (23-126/2010-11/CCRH/Tech/EMR/888) from CCRH under the Ministry of AYUSH, Government of India, New Delhi, India. Naser B, Bodinet C, Tegtmeier M, Lindequist U. Thuja occidentalis (Arbor vitae): A review of its pharmaceutical, pharmacological and clinical properties. Evid Based Complement Alternat Med 2005;2:69-78. Baran D. Arbor vitae, a guarantee of health. Rev Med Chir Soc Med Nat Iasi 1991;95:347-9. Spelman K, Burns J, Nichols D, Winters N, Ottersberg S, Tenborg M. Modulation of cytokine expression by traditional medicines: A review of herbal immunomodulators. Altern Med Rev 2006;11:128-50. Gohla SH, Haubeck HD, Schrum S, Soltau H, Neth RD. Activation of CD4-positive T cells by polysaccharide fractions isolated from the Cupressaceae Thuja occidentalis L. (Arborvitae). Haematol Blood Transfus 1989;32:268-72. Offergeld R, Reinecker C, Gumz E, Schrum S, Treiber R, Neth RD, et al. Mitogenic activity of high molecular polysaccharide fractions isolated from the Cuppressaceae Thuja occidentalis L. Enhanced cytokine-production by thyapolysaccharide, g-fraction (TPSg). Leukemia 1992;6 Suppl 3:189S-91S. Silva IS, Nicolau LA, Sousa FB, Araújo S, Oliveira AP, Araújo TS, et al. Evaluation of anti-inflammatory potential of aqueous extract and polysaccharide fraction of Thuja occidentalis Linn. in mice. Int J Biol Macromol 2017;105:1105-16. Linde K, Melchart D. Randomized controlled trials of individualized homeopathy: A state-of-the-art review. J Altern Complement Med 1998;4:371-88. Mahajan UB, Walke AK, Kardile MV, Goyal SN, Sidharth S, Kundu CN, et al. Anti-inflammatory homoeopathic drug dilutions restrain lipopolysaccharide-induced release of pro-inflammatory cytokines: In vitro and in vivo evidence. Indian J Res Homo 2017;11:158-69. Oshioka T, Fujii E, Endo M, Tokunaga Y, Shiba N, Hohsho H, et al. Anti-inflammatory potency of dehydrocurdione, a zedoary-derived sesquiterpene. Inflamm Res 1998;47:476-81. Patil CR, Rambhade AD, Jadhav RB, Patil KR, Dubey VK, Sonara BM, et al. Modulation of arthritis in rats by Toxicodendron pubescens and its homeopathic dilutions. Homeopathy 2011;100:131-7. Kshirsagar AD, Panchal PV, Harle UN, Nanda RK, Shaikh HM. Anti-inflammatory and antiarthritic activity of anthraquinone derivatives in rodents. Int J Inflam 2014;2014:690596. Chanchal SK, Mahajan UB, Siddharth S, Reddy N, Goyal SN, Patil PH, et al. In vivo and in vitro protective effects of omeprazole against neuropathic pain. Sci Rep 2016;6:30007. Patil KR, Patil CR, Jadhav RB, Mahajan VK, Patil PR, Gaikwad PS, et al. Anti-arthritic activity of bartogenic acid isolated from fruits of Barringtonia racemosa Roxb. (Lecythidaceae). Evid Based Complement Alternat Med 2011;2011:785245. Yang J, Cai HD, Zeng YL, Chen ZH, Fang MH, Su YP, et al. Effects of koumine on adjuvant- and collagen-induced arthritis in rats. J Nat Prod 2016;79:2635-43. Yoon WJ, Ham YM, Kim SS, Sam BS, Moon JY, Baik JS, et al. Suppression of pro-inflammatory cytokines, iNOS, and COX-2 expression by brown algae Sargassum micracanthum in RAW 264.7 macrophages. Eur Asian J Bio Sci 2009;3:130-43. Weichman BM, Chau TT, Rona G. Histopathologic evaluation of the effects of etodolac in established adjuvant arthritis in rats: Evidence for reversal of joint damage. Arthritis Rheum 1987;30:466-70. Janadri S, Gowda H. Evaluation of analgesic and anti-inflammatory activity of leaves in Thuja occidentalis chemically induced animal models. Adv Pharm J 2016;1:26-30. Bellavite P, Conforti A, Pontarollo F, Ortolani R. Immunology and homeopathy 2. Cells of the immune system and inflammation. Evid Based Complement Alternat Med 2006;3:13-24. Tsiri D, Graikou K, Pobłocka-Olech L, Krauze-Baranowska M, Spyropoulos C, Chinou I, et al. Chemosystematic value of the essential oil composition of Thuja species cultivated in Poland-antimicrobial activity. Molecules 2009;14:4707-15.